Nonspecific interstitial pneumonia (NSIP) is a kind of interstitial lung disease. It is a rare condition in which the tissue that surrounds and separates the alveoli (the small air sacs of the lungs) gets inflamed. The condition may also lead to the inflammation of the pleura (a thin covering which provides protection and cushioning to the lungs and their individual lobes) in some cases. In other words, Nonspecific interstitial pneumonia characteristically leads to the inflammation of the mesh-like walls of the alveoli and the pleura. The exact cause of Nonspecific interstitial pneumonia is not known, though hereditary factors are believed to play a role in the development of the condition. Moreover, Nonspecific interstitial pneumonia often develops in various diseases, including HIV, diseases resulting from reactions to certain medications, diseases which affect the body’s structural tissues (connective tissue disorders) and several other conditions. There are basically two main types of Nonspecific interstitial pneumonia --- Cellular and Fibrotic. In people affected by Cellular form of NSIP, the cells of the interstitium get inflamed; whereas in the people affected by Fibrotic form of NSIP, the lung tissue thickens and gets scarred, and thus cannot function effectively. Although it is possible for inflammation as well as fibrosis to be present simultaneously, the prognosis is comparatively much better for patients suffering from Cellular form of NSIP than those suffering from Fibrotic form of NSIP. Clubbing (fingertips getting enlarged at the base of the nails). Nonspecific interstitial pneumonia is associated with damage to the lungs, and hence the treatment for the condition basically involves the timely management of its symptoms. For effectively managing the symptoms of Nonspecific interstitial pneumonia, Planet Ayurveda herbal manufacturing offers some beneficial herbal products. These products are safe to use and do not have any side effects because they are prepared under the guidance of Ayurvedic experts. The products are made from 100% pure and natural herbs, without the use of any chemicals, preservatives or additives. Aller-G care capsules are prepared from some extremely beneficial herbs which have proven anti-inflammatory, anti-bacterial, anti-viral, anti-allergic, antibiotic and antiseptic properties. The herbs used for preparing these capsules include: Neem (Azadirachta Indica), Shirish (Albezzia Lebbock), Haridra (Curcuma longa), and Ashwagandha (Withania Somnifera). The use of Aller-G Care capsules is very helpful in managing allergies, eliminating toxins from the body, boosting the immune system, providing strength to the body, treating skin ailments, managing respiratory tract problems, treating hair loss, and managing Asthma and several other conditions. The dosage of Aller-G Care capsules recommended for managing Nonspecific interstitial pneumonia is: 2 capsules three times a day. These capsules are an amazing herbal product because of the abundant presence of ‘Curcumin’ --- the biologically active compound of the ‘Haridra’ herb (turmeric; Curcuma longa). Curcumin is widely used in Ayurvedic formulations due to its proven medicinal properties. Curcumin capsules can be very beneficial for NSIP patients as they contain 100% natural and standardised Curcumin extract up to 95% Curcminoids. These capsules can manage inflammation, treat allergies, provide relief from pain, treat respiratory disorders, manage ulcers, and treat cough and other related conditions. The dosage of Curcumin capsules recommended for managing Nonspecific interstitial pneumonia is: 2 capsules twice daily, with plain water, after meals. These capsules are an excellent herbal product prepared from the pure and natural extract of the widely known ‘Tulsi’ herb (Ocimum sanctum), which is considered a natural immuno-modulator. The herb is extremely beneficial in managing auto-immune disorders, cancers, diabetes, skin allergies and other allergic conditions, and Chronic Sinusitis. The use of Tulsi capsules can enhance immunity; reduce the harmful effects of environmental toxins; rejuvenate the pancreas; and provide calcium, bioavailable antioxidants, Vitamin A and Vitamin C to the body. The dosage of Tulsi capsules recommended for managing Nonspecific interstitial pneumonia is: 2 capsules three times a day. For preparing these capsules, two extremely beneficial anti-inflammatory components are used. These components are: Shallaki (Boswellia serrata) and Curcumin (the main active component of turmeric or Curcuma longa). These capsules are very helpful in providing relief from joint pains, treating joint inflammation and other inflammatory conditions, reducing swelling, treating allergies, managing different kinds of tumors and cancers, treating breathing disorders, and supporting good joint health. In addition, these capsules can also balance the ‘Vata’, ‘Pitta’ and ‘Kapha’ doshas of the body. The dosage of Boswellia Curcumin capsules recommended for managing Nonspecific interstitial pneumonia is: 1-2 capsules two times a day. 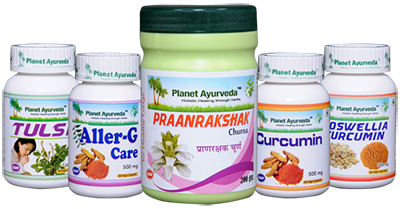 Praanrakshak Churna is an excellent herbal powder that combines some powerful anti-allergy herbs which have been in use by Ayurvedic experts since ancient times. The herbal components of the churna include: Shirish (Albezzia lebbock), Vaasa (Adhatoda vasica), Dalchini (Cinnamomum zeylanica), Anantmool (Tylophora asthmatica), Kantkari (Solanum xanthocarpum), Mulethi (Glycrrhiza glabra), and Bharangi (Clerodandrum serratum). The churna can be very beneficial in treating all types of allergies, managing cough, treating respiratory tract infections, treating asthma, and controlling Sneezing, Rhinitis, and Sinusitis. The dosage of Praanrakshak Churna recommended for managing Nonspecific interstitial pneumonia is: 1-2 teaspoons with plain water, three times a day, after meals. The above-mentioned herbal formulations, when used regularly after consultation with an Ayurvedic expert, can be very effective in managing the symptoms of Nonspecific interstitial pneumonia. Since all the herbal formulations are prepared from pure and natural herbs, they are absolutely safe to use; and, when used in a synergistic manner, can provide excellent results for the patients suffering from Nonspecific interstitial pneumonia.